Read how we save energy and cut carbon emissions at home from 6 tonnes of CO2 per year to zero! Cut waste and use energy more wisely to save money on your bills. Be more comfortable. Save the planet to boot! It may not always be fashionable to be frugal. But energy thrift is always good! Turn off when you're not using something: TVs, games consoles, lights. Set TVs, computers and so on to turn themselves off or sleep automatically when you haven't used them for a while. Takes no real effort nor money but makes a difference! Don't leave lighting and heating on in rooms that you're not using. ~50% of the money spent on heating is wasted that way, costing hundreds of £s each year. When buying new appliances and lights etc, buy the most energy efficient that you can find and afford. Don't keep running old freezers in your garage if they are more than a decade old, or extra 'beer' fridges. They are likely huge money and electricity guzzlers! Look at the 'See also' sidebar links for other great ideas to save your wallet. Every kWh of gas (burnt on-site for heat) saved avoids production of ~0.19kg of CO2. Please read on if you want to learn the gory details... How we reduced our energy consumption by about three times. We maintained comfort, and went carbon negative too. I measured the power used by some gadgets around the house and in my study. What is worth turning off or even replacing, given that some is old? Having done this survey (June 2007), we're going to make more effort to turn things such as the PC and cable TV box and stereo off completely. The biggest potential saving is to replace my aging servers with one low-power laptop for less than 5% of the electricity. (Still doing the same work!) At some point the laptop might even be moved 'off-grid', to solar power. But that's a separate saga. The laptop should pay for itself in one year in reduced electricity bills. Thanks very much to Adam of XePhi for suggesting and devising configurations and power-saving tweaks. And for slaving away measuring power draw of his stock kit, and more! As of late July 2007 the old server farm has been turned off and replaced with a much lower-power solution saving ~640W+ every hour of every day. In late August 2007 our quarterly electricity bill arrived with a huge 30% drop. Even though most of the power savings had only been in place for about 1 month before the meter reading! So almost all our electricity had been for powering these servers, and I'm now getting almost all the features that I was before for a tiny fraction of the energy and a lot less noise and heat in my office. On 1st September, at home all day (though on my own as it happens), less than 4kWh of mains electricity was used over a 24-hour period. 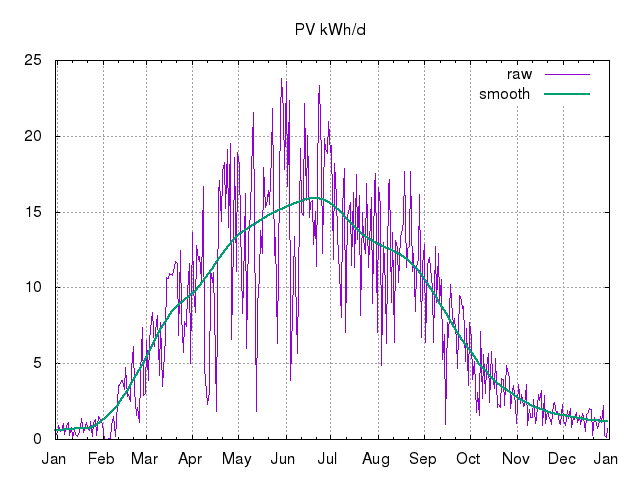 That compares well to ~33kWh/day average for the previous quarter last year. Thus nearly a 90% reduction in usage if this day proves anything like typical. 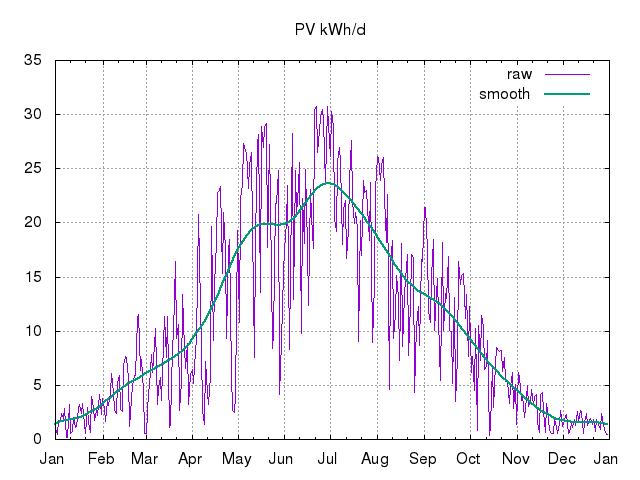 Also, 4kWh/day is just about do-able by solar PV in the UK in our local area. (There's a practical limit of about 4kWp of RE that the local electricity distribution network (EDF) will allow to be attached to one phase in a small domestic installation.) 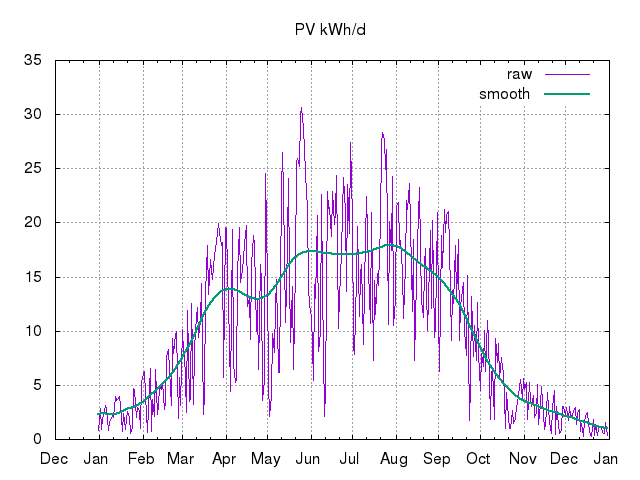 That 4kWp should be able to generate 4kWh/day even on almost the darkest London winter days. So we could, with a grid-tie, be a net exporter overall. And on almost every single day too. I've now stopped using expensive computing equipment as space heating. It will be interesting to see if our gas usage/bill goes up any in winter to compensate. 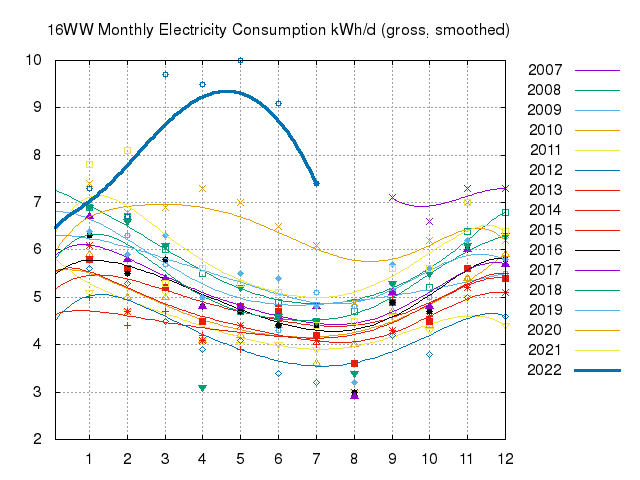 (As of 2008/07 it would seem that we're up from ~9.1MWh/y to ~9.8MWh/y.) Even if it does, it's still better in money and CO2 terms to use mains gas (methane) to generate heat on site than to use electricity. If the house is too cold after this change then it will be worthwhile improving our insulation, not so before, which will be another good thing! (For the record, the August 2007 gas bill was ~£30 for 28 units (875kWh) for the quarter, ie ~10kWh/day, which is for heating and cooking, and is about 1/3rd the cost of electricity for those purposes.) 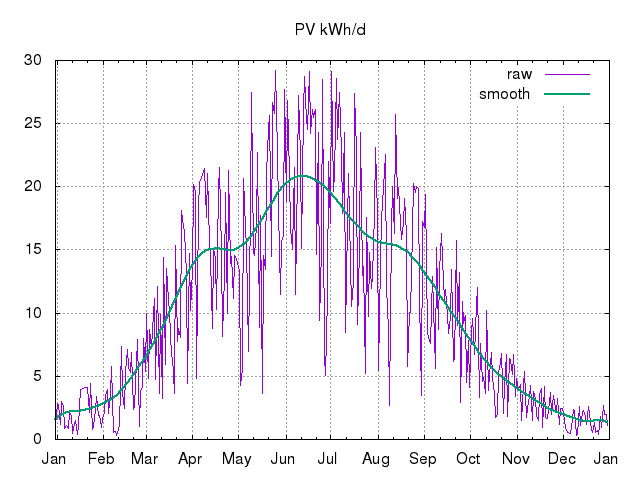 On average a London 4kWp solar PV system might generate an average of ~10kWh/day (across the whole year). So we'd still be net overall consumers of energy between gas and electricity, especially in winter. 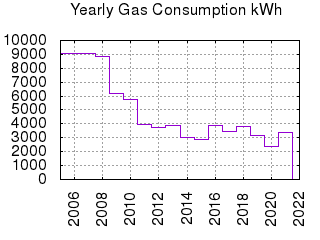 As of 2008/03/03 when we replaced our old fridge/freezer with an A+ rated one, I expect our gross consumption to fall to ~6kWh/day, and with the solar PV installed the previous week I expect our year-round net consumption to be ~5kWh/day, ie my original target for the whole house. 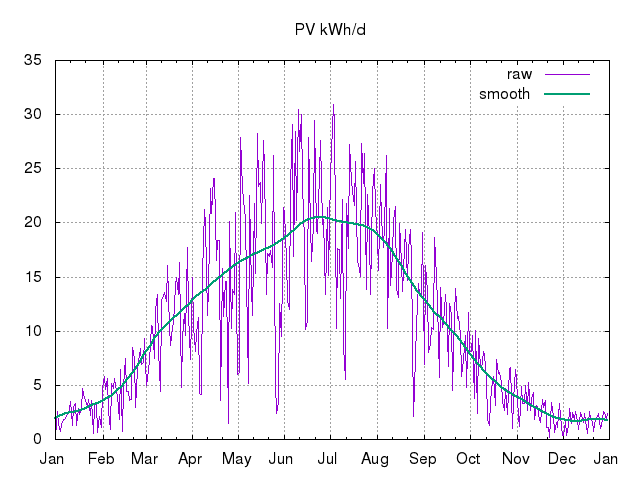 On 2008/03/13 with the rest of my family away and almost no discretionary usage other than my laptop and a few cups of tea, I achieved a (nearly) 0kWh day, ie the import meter was reading the same kWh units at the end of the 24h as at the start. 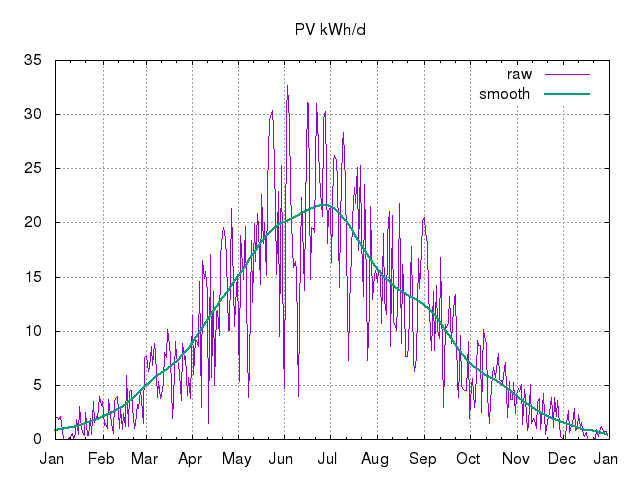 In reality I used about 0.8kWh more than was PV-generated. For a tiny bit of perspective, one (now defunct) investment bank said that if all the computer monitors in its London head office were switched off every evening as of October 2007 then the bank would save as much as 500,000kWh per year worth £35,000 and reduce its carbon footprint by 21,000 kg of CO2. Total electricity use in the UK in 2006 was 382.5TWh, ie 382,500GWh, of which ~37% was coal, 36% gas, 18% nuclear and 4% renewables (see chapter 5 of the UK's 2007 Energy White Paper (EWP)). The Indian government target is to make available 1kWh/day to each household. On the heating (gas) side we've added a total of maybe 26cm+ of loft insulation, put in thermostatic radiator valves (TRVs) where possible (and we're turning down or off each radiator when not in the room), put cardboard and/or foil behind radiators on exterior walls, put up a letter-box draught excluder and a door curtain for the front door, replaced some cracked/old/leaky (double-glazed) windows, put in an internal door curtain for our living room, and generally tried to trim heat demand. It seems from last month's figures that we may have nearly halved consumtion for a given number of heating-degree days, though it's difficult to tell yet. Against that we have a newborn in the house this month which means more heat, washing and drying (and no chance to dry outside on the line). 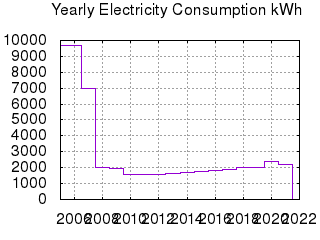 In 2008 we consumed just over 2MWh of electricity (<6kWh/d). 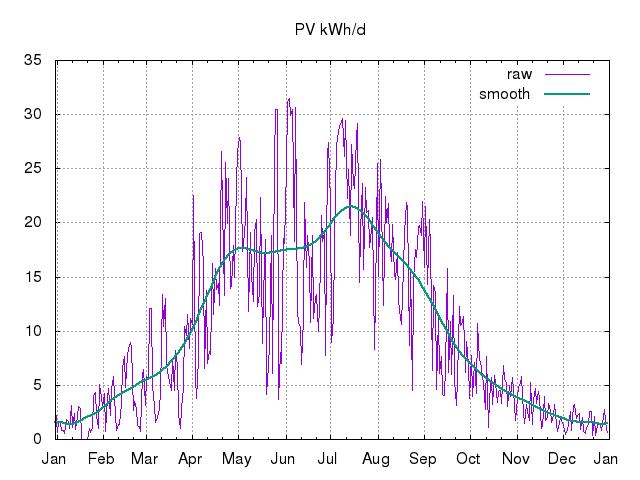 We exported/generated 0.9MWh (solar PV, resulting in net consumption ~3kWh/d). 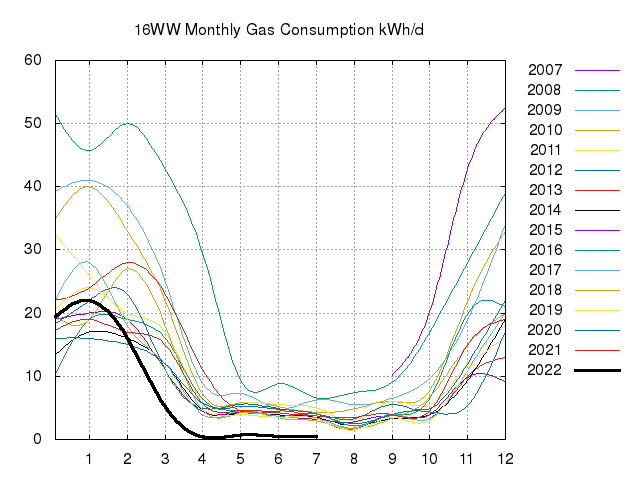 Total mains natural gas consumption was well under 9MWh. We had our single-glazed front door replaced with a double-glazed unit. We had an internal door fitted to our living-room, absent since move-in. We hope that both will reduce heating demand and improve comfort. 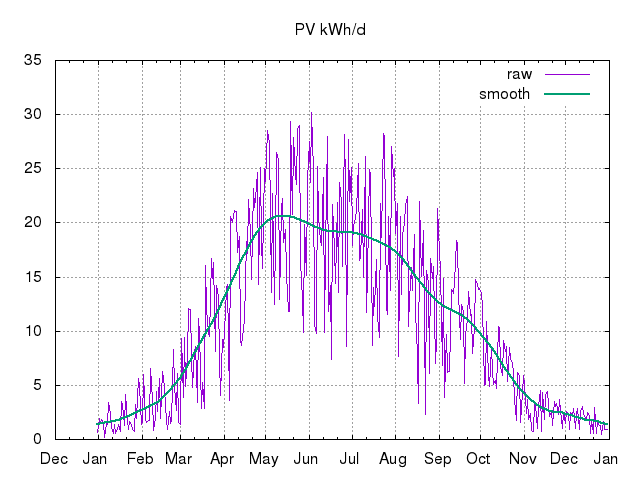 For 2009 daily electricity consumption is down to a little over 5kWh (5 units). 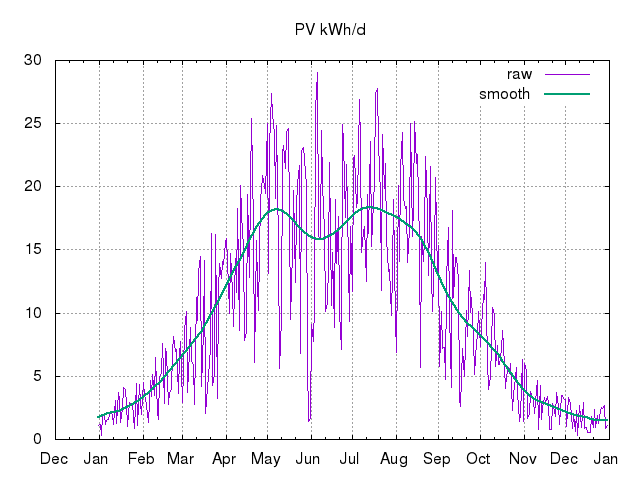 On average the solar PV generates much more than we use. We export a net excess of about 1MWh (1000 units) per year to the grid. A new washing machine that allows cold and 30°C washes is probably saving us about 0.5kWh/day compared to last year, as is the latest energy-sipping incarnation of my Internet server. 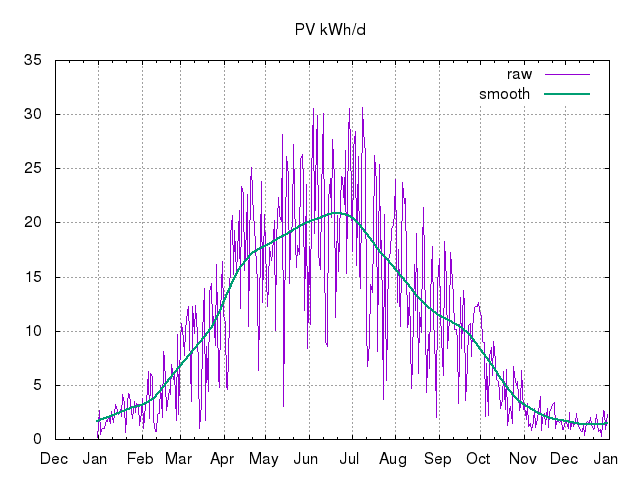 In March--August 2009 (inclusive) the solar PV generated just over 2MWh. The increased output from the expanded system matched our expected consumption for the whole year. Gas consumption for cooking, hot water and radiators has been a little over 6MWh for the year, down from ~9MWh/year previously. 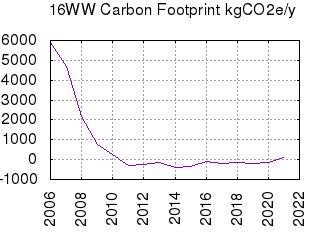 As a result our net carbon footprint for the house is a little over 0.7tCO2/y. Maybe one eighth of that from before we started energy conservation, and possibly less than one-sixth of an average UK house's (based on 3.3MWh/y typical electricity use at 0.43tCO2/MWh thus 1.4t, and 18MWh/y gas at 0.19tCO2/MWh thus 3.4t, so 4.8tCO2/year total). 2011 was likely slightly carbon-negative. In March we were assessed to be a 'SuperHome' (number 119), with nominal carbon savings (ignoring our PV) of 62%. See which electrical appliances use what at home. See also Saving Electricity and Gas: Side Story for a little more of the history. We moved into our current house 2004/06/14. From 2004/06/14 to 2007/08/21 we used 30705 units of mains electricity (~31MWh) over 38 months, ie ~27kWh/day, or ~10MWh/year electricity ie ~4.3tCO2/year. From 2004/06/14 to 2007/08/21 we used 869 units of mains gas (28 units since 2007/05/17, and 865 units (~27MWh) over the 36-month period 2004/10/21 to 2007/10/17, with an annual HDD12* of ~1160) ie ~25kWh/day, or ~9MWh/year gas ie ~1.7tCO2/year. Thus our total primary domestic energy consumption (gas and electricity) was responsible for ~6t CO2 per year for two adults (and then lately two children). About 3t CO2 per year per adult. 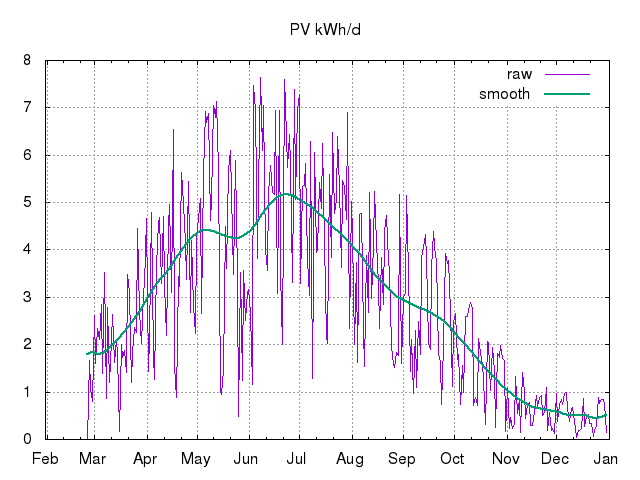 Note that figures for kWh generated come from our Ofgem-approved meters. 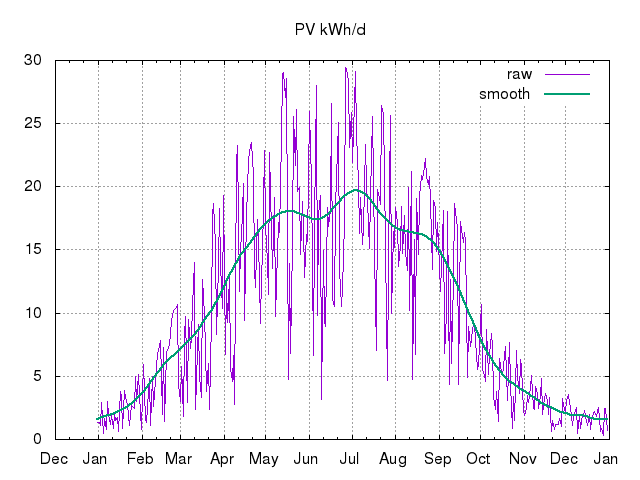 The per-day log files are the slightly-less-generous outputs from the grid-tie inverters. Thus there are small differences (~5% as of end-2009). 2018/03/20: Where do you fall on the personal finance spectrum? : "There's usually a development of a set of strong internal principles which that person tries to live by to the best of their ability, and those principles often aren’t in line with what’s 'mainstream' in society.". 2012/04/02: Domestic energy use map of Britain down to very small areas giving consumption averages for ~6000 people. Area E02000602 in Kingston upon Thames: average consumption of gas, per meter: 13,143kWh, average consumption of electricity, per meter, kWh: 4,106kWh (cf ~6,000 and ~1,000 imports (~1,500 gross consumption) respectively for us). Stern and the IPCC suggest (Times, 2009/02/01) that we need to get down to about 2tCO2e/year each. The article says "the scale of the challenge [...] is huge. At the moment humanity generates the equivalent of about 50 billion tonnes of carbon dioxide a year, roughly equal to eight tonnes for every person on the planet. There is, however, huge variation. Europeans generate 11-14 tonnes per head and Americans about 22 tonnes, while Africans typically generate 1-2 tonnes." So, for our household in 2008 our household primary energy (gas and electricity) alone was about 25% of our emissions 'budget'. The NETA Balancing Mechanism Reporting System (BMRS) site is a useful source of real-time and historical UK grid-related data. There are various smart power-strips to turn lots of things off at once while avoiding bending down too often, or delving behind the sofa, such as from oneclick. 1kg of firewood corresponds to about 1kWh of electricity. 1kg of coal and oil correspond to respectively 3 and 4kWh of electricity. 1kg of natural uranium corresponds to about 50,000kWh of electricity. 1kg of plutonium corresponds to about 6,000,000kWh of electricity. I gathered "heating degree days" (HDD) data from DegreeDays.Net for estimating underlying heat need/demand, to help normalise actual consumption and thus efficiency values. Incidentally, Martin of DegreeDays.net was very helpful over email too, eg with this 5-year block to December 2008 for my local weather station at London Heathrow (EGLL)! 80% savings on October (final EDF) bill. First published 2007-06-15 , updated 2019-04-18 , rebuilt 2019-04-19 . Site copyright © 2007-2019 Damon Hart-Davis. Hosted by ExNet.